The geographical patterning of the occurrence of the two words suggests that the southern and Standard English word is beginning to spread north, and in a rather interesting way. 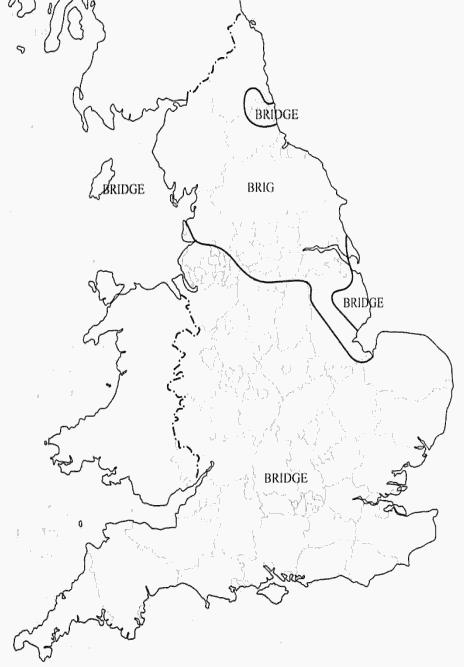 In its spread northwards, bridge has first invaded the coastal city areas of Sunderland and Grimsby, and then spread outwards again from these centres. This is just one example of the importance of urban centres in the spreading of new forms in language . . ., and of the way in which the increasing urbanization of England has contributed in this century to the loss of Traditional Dialects. ・ Hotta, Ryuichi. "The Development of the Nominal Plural Forms in Early Middle English." PhD thesis, University of Glasgow. Glasgow, November 2005. ・ Chambers, J. K. and Peter Trudgill. Dialectology. 2nd ed. Cambridge: CUP, 1998. ・ Trudgill, Peter. The Dialects of England. 2nd ed. Oxford: Blackwell, 2000.